Kaju Katli or Kaju Barfi is one of the tasty sweet dish that can be prepared and serve in any festive or party occasion. Whether it is a small birthday party or any festivals like Diwali, Guru Nanak Jayanti or Navratri, Kaju Barfi will be the right choice to have in sweet dish. 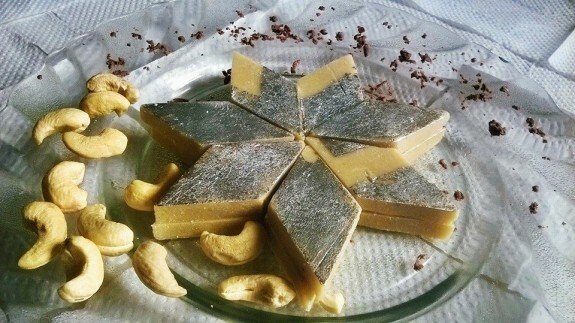 Get the step by step method of making Kaju Katli or Kaju Barfi or Cashew fudge at home. If you are making it in the first time, then please carefully follow each step as it is not so easy to get the exact barfi in the very first time. 1. Grind the dry cashew. The cashew should be in the powdered form. 2. Mix the grated khoya and sugar very well. 3. Now heat a pan and add the mixture of khoya and sugar. Stir it continuously. 4. Once the sugar dissolves, add the grinded cashew nuts and elaichi powder. 5. Constantly stir everything and mix well. Cook it till soft lumps form and does not stick to the side. 6. Roll on the flat surface as per the thickness and apply the silver foil on the above. It is better if you place it on a butter paper or on a greased plate. 7. Let the cashew dough cool. 8. When completely cooled, cut it with a sharp knife as per the barfi (diamond) shaped shown in the picture. 9. Kaju Barfi is ready to serve.